As a part of our Cyber Awareness series this month, we’re continuing the conversation by talking about hackers and small businesses. Last week, we spoke about the importance of locking down your login. Small business owners everywhere don’t understand their risk levels when it comes to hackers. 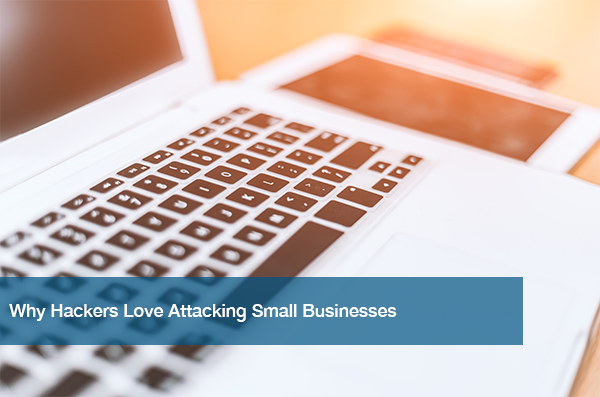 About 82% of small business owners say they aren’t targets for attacks. This is because many think they have nothing worth taking. The reality is that in 2015, 63% of small businesses said they were attacked at least once. This proves that the threat level is high. It’s important to know that a data breach or hack of any kind can shut down your business. This can lead to a lack of trust from your suppliers all the way down to your customers. Thus, it’s crucial to always have plans in place to protect your business from hackers. It’s important to understand why small business are the targets of these hacks in the first place to develop any action plans for protection. It’s naive to believe that your small business has nothing to offer a hacker. They actually love everything about you! This past year, Visa Inc. revealed that 95% of credit card breaches are from its smallest business customers. Additionally, they love attacking for your intellectual property and your identifiable information. This is because most small businesses don’t have heavy protection in the first place for these items. Hackers love your employees just as much as you do. 77% of all employees leave their computers unattended, allowing room for hacks to occur. Hackers steal credentials from key employees and send faulty emails to trick others for information. Know that former employees could pose as hackers and steal data by using cloud services to reenter networks. Having said this, it’s important that employees are trained on cyber security protocols. No plan means no protection. Small businesses often don’t have the equipment in place to protect themselves. They often have fewer resources for cyber security, too. Hackers know this, and see it as an easy opportunity to steal the information of others. Why fight the big dogs when you can fight the smaller one with ease? 60% of small business owners that suffer a breach go out of business after six months. Don’t let this be your business. Take the basic yet necessary steps to protect yourself now. You should establish Internet security policies from the beginning. Also, teach your employees the basics of best practices. For example, how to detect what looks suspicious. Encourage them to speak up if they notice strange happenings on their computer. Last, highlight the importance of protecting company and customer information. Identify both critical company and customer information that should be secure always. Lock down your login information by making passwords long, strong, and unique. For more information on this, check out our previous post. Make sure all machines have correct updates and are clean to protect from malware, viruses and infections. Set security and privacy settings to your comfort level. Always stay up-to-date on the latest in cyber security to make sure your customers feel that their information is secure. Need some help implementing your perfect plan for cyber security? Call ITC today at (512) 348-8324 to schedule your free IT needs assessment. Together, we’ll examine your current systems and provide solutions that fit the needs of your business.